Christmas is just around the corner and if you're like me and haven't started gift shopping yet (I plan to go next week!) then here are some of my favourite picks for women that might help you! Perfume. Either one of their favourites or you can find a new scent that you like and would love to gift. I would recommend the Flora By Gucci, it has been one of my faves for a while (I've just finished my second bottle). You can also save £15 at Fragrance Direct. Jewellery. Does she prefer gold or silver? Does she usually wear necklaces or bracelets? Argento sell the most beautiful jewellery from all different brands so you're always going to find something for someone. I love the birthstone necklaces and the Swarovski Remix Collection Carrier - so you can start to collect charms to add to the beautiful, dainty bracelet! In my photo above you can also see my Thomas Sabo Charm Bracelet. Shoes. A new pair of trainers (always a win for me) or a pair of shoes to wear on NYE. You just can't go wrong with a new pair of shoes. 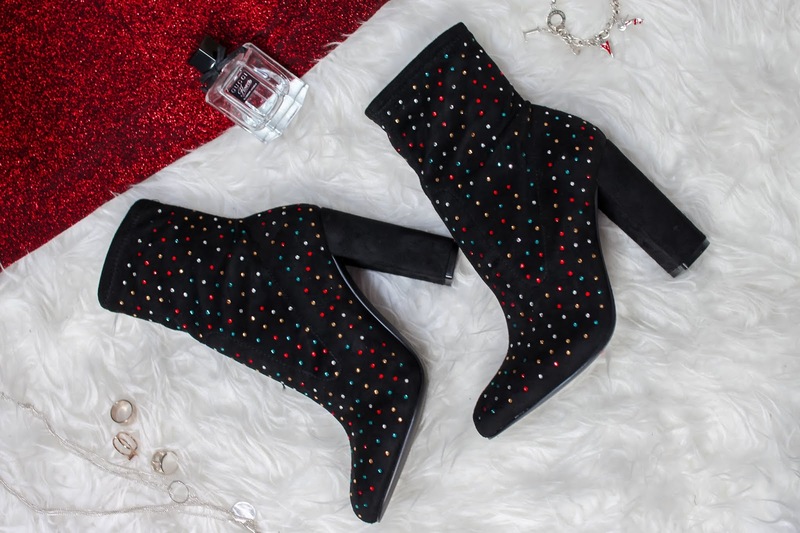 I am loving these Asos Elsa Embellished Sock Boots, I want to wear them every time I go on a night-out. For more gift ideas, have a look at this widget for things I am obsessed with that would make perfect Christmas gifts for any girl!